2. Saute the onions for 3 minutes or until soft. 4. Add the zucchini pieces and cook for a minute. 5. Pour the vegetable stock and simmer for 5 minutes or until the zucchini is tender. 6. Remove and keep aside for 5 minutes. 7. Using a hand blender or a regular blender, blend the soup until smooth. 8. Add 2 tblsp of the cream and mix. 9. Pour into individual serving bowls. 10. Garnish with the remaining cream and serve. 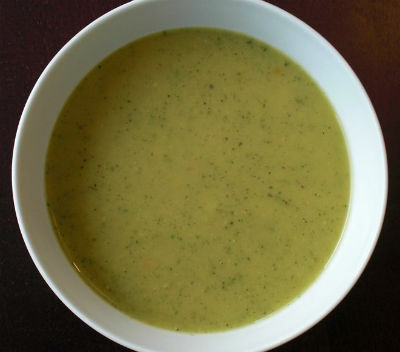 Feel free to comment or share your thoughts on this Zucchini Soup Recipe from Awesome Cuisine.